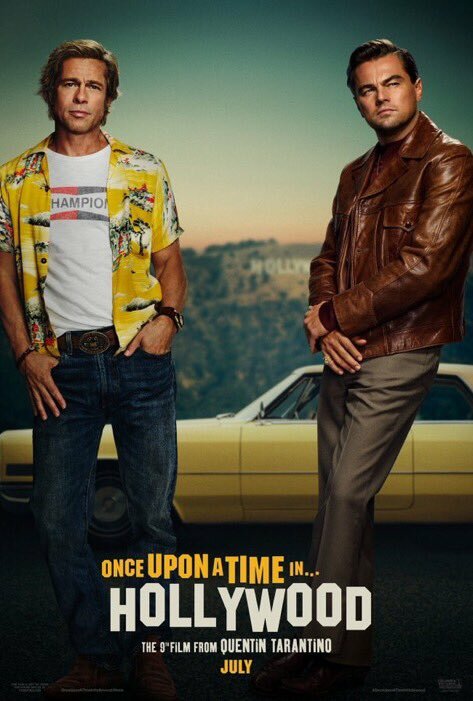 Quentin Tarantino’s latest movie, Once Upon a Time in Hollywood, has a poster for us to Look At and Assume Things. It has Brad Pitt and Leonardo DiCaprio with a vintage car, and the Hollywood sign in the far background. This movie is set in 1969 so I am calling bullsh-t on that Hollywood sign. By 1969, the sign was severely deteriorated, with the “O” being broken so badly it looked like a “U”. That sign in the background should be decayed. It’s a famous landmark, people will still know what it is even if the “O” is f-cked up. Pitt and DiCaprio, meanwhile, look like they’re in two different movies. DiCaprio’s photo looks like he’s in a gangster movie—a rejected wardrobe test from The Departed. Pitt, meanwhile, looks like he just stopped to pose for a photo with a fan. I get that they’re supposed to look like the movie star (DiCaprio) and his stunt double (Pitt), but is there any world where Brad Pitt doesn’t look like a movie star? He just looks like himself on a day off. So not the most world-burning poster with details to pick apart about the film except that no one bothered to make the Hollywood sign period-accurate (a detail I don’t expect Tarantino to miss in the movie itself). I think the biggest takeaway is that this is “Tarantino’s Sharon Tate movie” and the poster is staying a million miles away from that. If you don’t follow entertainment news, and you see this poster in a movie theater, all you’re going to know is that Brad Pitt and Leonardo DiCaprio are in Quentin Tarantino’s latest movie. That will be enough to put a LOT of butts in seats. For the vast majority of people, this is going to work on nothing more than star names, something almost no movie does anymore. Meanwhile, I am over here still petrified of Quentin Tarantino tackling the Tate murders.